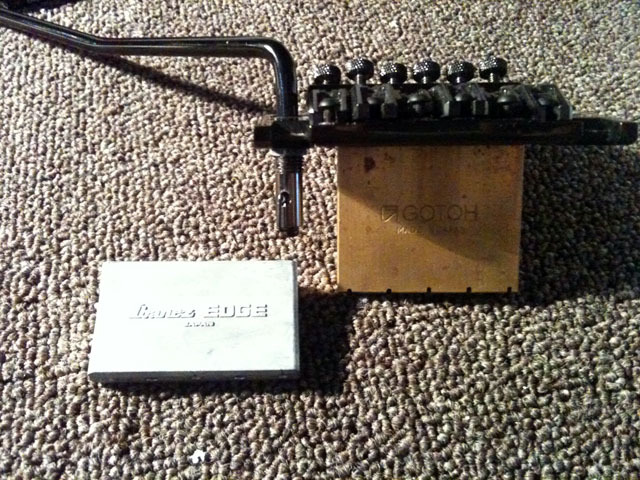 Stock Ibanez Edge block and the Gotoh brass block. Ibanez have made some fantastic locking tremolo bridges over the years. The Edge and Lo Pro Edge are highly regarded amongst Ibanez enthusiasts, and the recently discontinued Edge Pro is starting to receive a lot of praise too. There is a problem inherent to floating tremolo bridges though. They quite often have a thinner tone, and less sustain when compared to their hard tail brothers. This problem can be somewhat resolved by ensuring parts of the bridge are made of quality materials. Building the sustain blocks out of bell-brass for example beef up and brighten the tone, as well as offer more sustain than cheaper materials like pot metal. Gotoh’s licensed Floyd Rose tremolo bridge is fantastic, with the baseplate and saddles made of solid stainless steel, and the sustain block made out of brass. Whilst high-end Ibanez tremolo bridges have a great design they suffer tonally due to the pot metal used for things like the sustain block. The tone can be a bit lifeless and dull and the sustain suffers as a result of the pot metal, especially when played acoustically. A great upgrade then is replacing the sustain block with a brass replacement. A few companies out there like Floyd Upgrades offer not only brass big block upgrades, which are a cost effective way to really improve the tone and sustain of many Floyd Rose type tremolo bridges like the Ibanez Edge. They also offer more expensive options like titanium big blocks, which can give you a whole new sound. Check out my DIY for installing a Floyd Upgrades Big Brass Block here. I’ve previously reviewed the Floyd Upgrades big block for the Gotoh licensed Floyd Rose, and found that it gave a nice improvement over the stock brass block that the Gotoh comes stock with. I pondered what the difference a big brass block would make on an Ibanez Edge. While doing some work on my Ibanez 20th Ann RG550 RFR I decided that I would see if the stock brass block from my Gotoh tremolo bridge would fit the Edge fitted to my guitar. I’ve always found the tone of this particular guitar a bit dull and lifeless, and I felt the pot metal sustain block on the Edge wasn’t doing it any favours. I couldn’t afford a brass big block upgrade right now, and I hoped that the Gotoh block would at least bring a bit more life to my guitar. After removing my stock sustain block I was pleased to discover that the Gotoh unit was a direct fit. Gotoh actually made a number of tremolo bridges for Ibanez so I wasn’t too surprised by this. After putting everything back together I played my RG550 acoustically for a while, and was able to notice an immediate difference in the tone. Now I know that this is a bad cliché, but the difference in tone really was like lifting a blanket off. Everything about the guitar’s tone was brighter, fuller and more lively. The hard part now is that this change makes me really want a big brass block upgrade to really make this guitar sing even more. Hopefully I can get my hands on one sooner rather than later. the Gotoh block will do me for now though.